South Carolina Ancestral Research Magazine and Books: Excellent site for books by South Carolina genealogist Brent Holcomb. Volume Three of this series, Abstracts of the Records of the Surveyor General of the Province, Charles Towne Lots of Land, 1678-1698, was published in December of 2007. It provides abstracts of the early certificates for lots in Charles Towne, including references to houses, public buildings, wharves and the laying out of streets and alleys. The names of taverns and the size and number of buildings on lots is sometimes included. Lot descriptions often also include rich genealogical material such as occupations, family relationships, dates of deaths and marriages and the names of the original lot holders. These records reveal the origin of the town as six streets laid out on high land between creeks and marshes and chronicle its growth into a bustling port town. Included are 18th and 19th century maps of the town, as well as three newly-created maps of early Charles Towne. The editors have provided lot histories for the first 100 lots, giving house locations for many who trace their roots to Charles Towne and information on some previously unknown names of colonial South Carolina families. Woven through the records are enticing clues to the lives of these original settlers of South Carolina. As early as 1677, lots were being officially laid out on Oyster Point, the site of present-day Charleston, South Carolina. By 1680, the town boasted about one hundred houses, a thriving port and the seat of the government in Carolina. Its citizens included landed gentry, shopkeepers, indentured servants, slaves and boatloads of refugees seeking religious and political freedom. The introduction of Abstracts of the Records of the Surveyor General of the Province, Charles Towne Lots of Land tells of the harrowing voyage of the First Fleet of colonists, a voyage of storms, shipwrecks and lost compatriots. Quoting from letters of the period, the introduction reveals the fear of Spanish and Indian attack and the struggle of the fledgling settlement to procure food and supplies to survive the first year. The growth of the colony, the building of towns and the role the Surveyor General of the province of Carolina played in preserving the public records are discussed. Early maps of South Carolina and illustrations of the original seventeenth century records, as well as footnotes and appendices giving extra details into the lives of the settlers found within the pages. The extensive index provides access to the material on many levels to genealogists, historians and researchers. 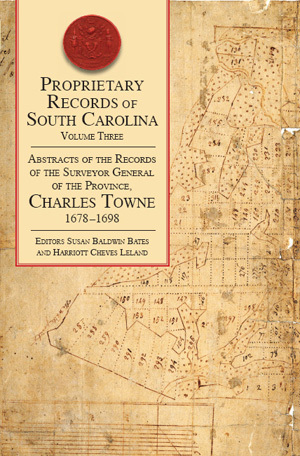 Volume Three of the Proprietary Records of South Carolina continues the standard of excellence set by the first two publications in the series. This book received the 2008 Best South Carolina Genealogical Book award from the SC Genealogical Society.